While Triceratops was a herbivore, Tyrannosaurus Rex or T. rex was a predator. Both these dinosaurs were contemporaries — they lived in North America during the Cretaceous period. Depictions of the two types of dinosaurs in popular culture commonly feature them battling each other and other dinosaurs such as spinosaurus and allosaurus. Quadraped Bipedal powerful tail allowed it to move quickly; could run up to 25 kmph. Typical walking speed of about 5 mph. Its legs were extremely big and powerful. Herbivorous Carnivorous; preyed on armored herbivorous dinosaurs, other T. Rex, scavenged. 1 complete, many partial Partial skeleton found in 1902. More than 30 partial Tyrannosaurus specimens have been found since. Over 30 specimens exist. 1887 Teeth from what is now documented as a Tyrannosaurus rex were found in 1874 by Arthur Lakes near Golden, Colorado. Triceratops lived in the Late Cretaceous period, around 68 to 65.5 million years ago. T. Rexes lived in the upper Cretaceous Period, around 67 to 65.5 million years ago. They were two of the last species of dinosaurs to exist before mass extinction. Triceratops was around 7.9 to 9 meters long, 3 meters tall, and weighed 6.1 – 12.0 tonnes. It had a large skull, one of the largest of all land animals, with a single horn on the snout, and a horn above each eye. The skull also had a large bony frill. It had short three-hoofed hands and four-hoofed feet. There has been some dispute over whether it walked with sprawling front legs, to support the weight of its head, or whether it had an upright stance. T. Rex is one of the largest land carnivores that ever lived. The largest specimen found is 12.3 meters long and 4 meters tall at the hips. Estimates of its weight have varied from 4.5 tonnes to 7.2 tonnes. It had a short, muscular neck, a huge head, powerful legs, and two short forelimbs with two clawed fingers each. It also had a long, heavy tail to balance out its huge head and torso. Triceratops were herbivores. They probably ate low growing plants, although they may have been able to knock down taller plants to eat. There is some debate over whether the T. Rex was a predator or purely a scavenger. The first specimen – a pair of brow horns – was discovered near Denver in 1887. T. Rex teeth were first found in 1974 by Arthur Lakes in Colorado. The first partial skeleton was found by Barnum Brown in Wyoming in 1900. Brown found a second skeleton in Montana in 1902. T. Rex was named by Henry Fairfield Osborn, president of the American Museum of Natural History, in 1905. One T. Rex track has also been discovered. It was found in New Mexico in 1983. 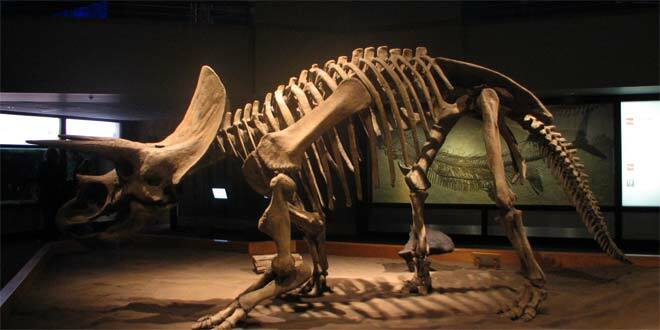 There is one complete Triceratops specimen, and many partial specimens are found each year. 47 complete or partial triceratops skulls were found in the Hell Creek Formation between 2000 and 2010. 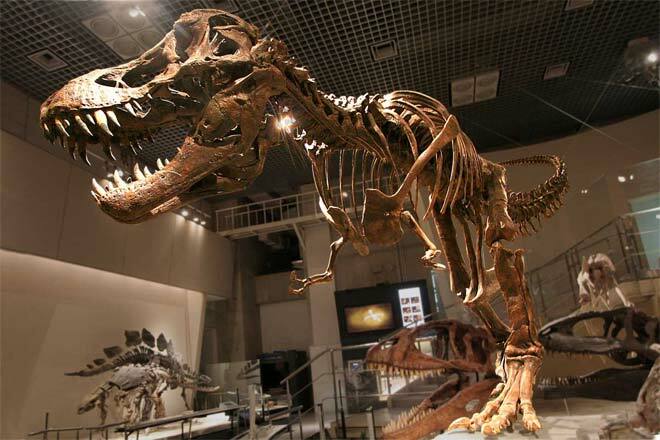 The average Tyrannosaurus lived to be approximately 30 years old, based on bone evidence provided in fossil remains. The lifespan for Triceratops has not been accurately determined yet. One theory suggests that a Triceratop has a lifespan similar to that of mammals/reptiles today, however, there is no scientific evidence to prove that Triceratops are warm or cold blooded. 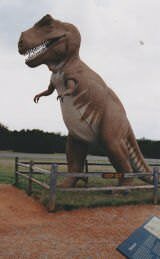 Tyrannosaurus are best described as large, bi-pedal, carnivorous theropod dinosaurs possessing powerful legs and torsos with numerous sharp teeth and tiny arms. There was a prior debate regarding sexual dimorphism in Tyrannosaurs, however this is now seen as geological dimorphism and not sexual. Triceratops may also be described as large, two real horns on the skull and a shorter "horn" on its snout, looks similar to a rhinoceros/ancient bison, carnivorous theropod, possessing powerful short three-hoofed hands and four-hoofed feet and torsos with numerous sharp teeth. It was smaller than Tyrannosaurus, giving it increased mobility and speed. The main character of The Land Before Time movies was a triceratops. Triceratops also appeared in Jurassic Park and the BBC documentary Walking with Dinosaurs. Many books, movies and displays show triceratops and T-Rex in the middle of a dramatic showdown. They were first depicted in this way in 1942, when Charles R. Knight painted a mural of them fighting in the Field Museum of Natural history for the National Geographic Society.